I’ve often been critical of event apps that either don’t work well or struggle to present the sort of information that could usefully have been summarised on a single sheet of A4 paper. And here we go again: The International Fleet Review app worked fine for me, in spite of poor reviews in the app store saying it hasn’t for others, but it fails to provide information I can’t get more effectively from a website or the newspaper. 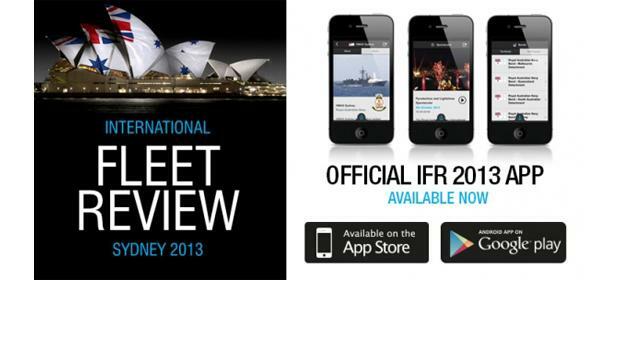 The app covers seven areas: What’s On, Ships, Aircraft, Spectacular, Bands, Transport, and Info. Some of these are less than truly useful being basically a list of links: The best of the app is in the What’s On, Ships and Aircraft sections. The What’s on list is useful. Sadly it could have been presented in a much more compact manner. It requires a lot of scrolling to get to the few entries for the day; especially because it seems to default to the top of the list rather than the current date. It’s this sort of detail that makes the app seem like a bunch of information that was available on paper and was tossed into an app because everyone has apps these days. When you follow a link the level of detail provided is significantly inferior to what you find on the Fleet Review website. The Transport section is almost completely useless: it just pulls in information from a separate website and fails to optimise it for viewing on a mobile device. If I access the fleetreviewtransport.info site directly in my browser on my mobile devices it works flawlessly: if I get taken to it from within the app, the site is an unusable mess. I fail to understand how something like this could have got through a testing process. The Spectacular section has a nice animated show and a list of vantage points from which to watch the real version on the 5th of October. Info is a grab-bag of stuff that doesn’t strictly fit elsewhere – from a currency converter to links to the ticketing site. Across all these functional areas, you get more and better information by going directly to the Fleet Review website. So unless you don’t have a data connection on your mobile device, just go to the website. Where the app should really stand out is in the Ships, Aircraft and Bands sections: These sections give a potted history of the various ships, aircraft and bands appearing in the Review. The information provided isn’t bad at all and I can certainly see that having this available as you sit by the Harbour can add something to the experience. Even here, though, there’s a sad lack of imagination shown in the app. The information is only useful if you can identify what you’re looking at – so listing by name is probably not the most useful approach. I would have expected something like those WW2 coast watcher charts, with a silhouette of the ship or even referencing on that big number they have printed on their sides. Something that would provide utility beyond me looking up the full info on Wikipedia once I’ve spotted the name at the back of the boat. (Of course a silhouette of a band might not work the same way – but it’d be amusing!) Even once I’ve managed to identify a specific ship or band, the app doesn’t tell me where to go to see it moored or playing. There seems to be a trend these days to provide an app when you have an event. It’s a bad trend. The Fleet Review has a good, functional and useful website. By comparison the app is broken, limited and lacks any imagination that would show it had been optimised for its intended use. The trend seems to me to be driven by a range of re-usable app environments into which data can be dropped to quickly and cost-effectively build an app. I get that. But there’s no point in it if the results are so poor – they give everyone involved a bad name. This harks back to the early days of the WWW when everyone had to have a website and completely lost site of the fact that content and utility ought to be the primary goals: Websites have generally moved on, it seems event apps are the new frontier. The app is available for free for both iOS and Android – we tested on iOS devices.